Discount Contact Lenses, online at DiscountContactLenses.com, is your one-stop shop for contact lenses. Discount Contact Lenses offers its selection at the lowest prices and even offers a price match guarantee. Discount Contact Lenses carries all the top brands and makes sure you get the exact prescription you need. Find Acuvue, Proclear, Purevision, SofLens, Freshlook, Focus, and many others at Discount Contact Lenses. Check with RetailSteal.com first for Discount Contact Lenses coupon codes, Discount Contact Lenses savings, and Discount Contact Lenses promotions. 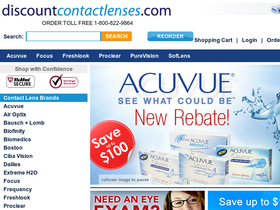 Discount Contact Lenses offers free shipping on US orders over $99. For other orders, regular shipping starts at $6.95. You may make returns within 30 days of purchase, as long as the item is in its original condition. See website for full details, exclusions may apply. Save 20% at Discount Contact Lenses using this coupon code on purchases $200+. Click to shop and save. Save up to 70% on contact lenses when you purchase from Discount Contact Lenses. Act now and take advantage of a 10% discount on any order with this coupon code from Discount Contact Lenses. Shop at Discountcontactlenses.com and save $10 with code. Must spend $60+ to qualify. Save $15 and receive free shipping on your purchase with this coupon code! Offer valid on orders of $100 or more. Save $20 and receive free shipping on your purchase with this coupon code! Offer valid on orders of $200 or more.